14. Travel entitlements of Government servants for the purpose of LTC shall be the same as TA entitlements as notified vide Ministry of Finance's O.M. dated 13.07.2017, except the air travel entitlement for Level 6 to Level 8 of the Pay Matrix, which is allowed in respect of TA only and not for LTC. ie Only AC 2 tier by train for pay level 6 to level 8. 18. Employees not entitled to travel by air may travel by any airline. However, reimbursement in such cases shall be restricted to the fare of their entitled class of train, transport or actual expense, whichever is less,"
(c) Air tickets can be purchased either directly from the airlines (booking counters/website) or through authorized agents only viz., `M/s Balmer Lawrie and Co. Ltd.', `M/s Ashok Travels and Tours Ltd.' and `IRCTC'. (f) Journey for these non-entitled employees from their Headquarters up to Kolkata/ Guwahati/ Chennai/Bhubaneswar / Delhi / Amritsar will have to be undertaken as per their entitlement. 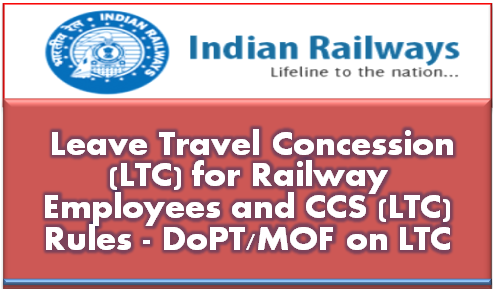 Railway employees are allowed to avail LTC as per DoPT OM dated 27th March 2018 2. Railway employees continue to be governed fully by the Railway Servants (Pass) Rules. 3. “All India LTC” once in a block of four years. 4. “All India LTC” will be purely optional for the railway employees.